What Do Workers Want in Work? Last night, we concluded our series of Redesigning Work dinners for 2016 in Sydney. We often get asked, why do we run these dinners? Well, firstly, the future of work is pretty ambiguous at this stage. There’s a lot happening: digital disruption, gender pay gap and even the changes in office architecture. Redesigning work is a vague, indeterminate and ambiguous idea. And, secondly, we embrace ambiguity. We are interested in solving problems, and ambiguity is a part of that process, because it deals with the abstract notion of a journey towards a solution. We pick topics that are interesting and we engage people to explore those conversations with us. It gives us permission to explore. Whether pushing fifty or just entering the workplace, a dominant thought amongst workers is the dichotomy of purpose vs. profit. There’s a drive in youth seeking roles based on ideals and values rather than money, and it relates back to the definition of success. We see higher engagement in entrepreneurial movements, perhaps as a responding to traditional institutions. Degrees become more like launchpads for ideas, rather than landing that high flying corporate role. What people define as success nowadays: does it occur post-career? Whar does it look like during one’s career? Getting a job, though attractive and stable, isn’t the sole indicator of success anymore. Entering work: as we’ve discovered through our research, the average time for a graduate to find full time work is 4.7 years. Pregnancy: more applicable to women, but also to the family unit. This has potential to destabilise the careers of both men and women, depending on the nature of the relationship. Exiting work: moving out of the workforce isn’t an easy transition, however more older people seek purpose and ideologically driven work following retirement. Time and time again, automation and task-based work comes up in conversation. Practically, with much of our work being outsourced to India and Singapore, service-based industries are likely to be, and already are, challenged by recent advances in artificial intelligence (AI). With outsourced centres, service-based roles drive countries like India. A report by Carnegie India advocates for government change and for policymakers to anticipate the transition and herald the tech revolution. On a more superficial note, people don’t want to be defined by an office space. The relationship between interactions, performance, and innovation is often best reflected in the modernity of offices. A example of such is the National Australia Bank’s head office in Docklands, a Woods Bagot-designed building. The building includes informal meeting spaces, collaborative tables and team huddle spaces. It’s fitted with those hot desk workspaces, designed to encourage meeting new colleagues and use spaces differently. Workspaces don’t even have to be a physical space. The workspace is the internet, a space fitted out for communication itself. Technology has faciliated and allowed collaboration between individuals even if they’re not present in the same loction. Not only do we look to redesign work, we need to redefine the people who hire the ‘redesigned workers’ of today. This means that people currently in a position of recruitment need to look beyond someone’s career experience and see their wealth in skills and look to their values. The expectation of work needs to be redefined. While processes may disappear, ‘soft skills’, such as interpersonality, will remain. When all processes become outsourced, only people will remain. And you need to be a ‘people person’ to engage other people. 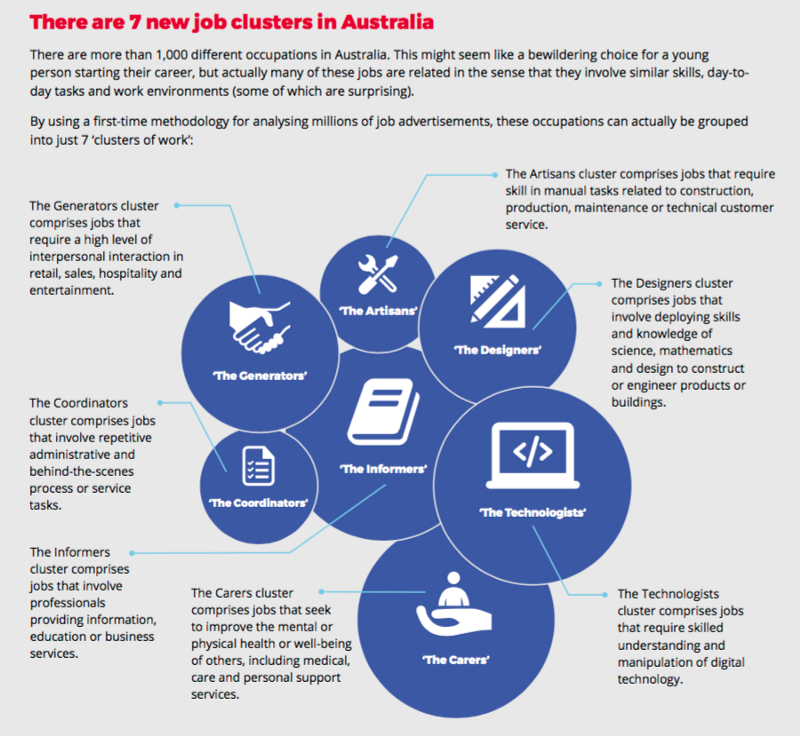 An report released by Foundation of Young Australians last week, titled #NewWorkMindset, talked about the idea of ‘job clusters’, a way to separate and define your skillsets. Many young people have adapted to this mindset of sharpening skills rather than advancing through a career seeking the same roles. Which may relate back to the redefinition of success: success may be found in scaling a mountain, or volunteering and may not necessarily involve a mortgage anymore. It comes back to relationships, engagement and the element of collaboration. Developing those skillsets is important, because the worker becomes the center of the whole paradigm of engagement. In 2017, we’re bringing together the best ideas into one place and presenting the Redesigning Work Conference. Read more here.